The walls of the Black Oak Outfitters guest house were filled with the laughter and excitement. I was self proclaimed den mother of fifteen year old Alexa, and Mikayla, fourteen year old Elizabeth, thirteen year old Victoria and ten year old Lexi. Mikayla had harvested her blacktail doe before I had arrived and the other girls were wound up with anticipation of their first hunt for blacktail deer. Hunters Victoria and Alexa, Mikayla was observing. The hunt carried a “The Good Old Days” theme and was complete with Jack Lewis’s 1914 Model T Ford Roadster. Gary Lewis, host of Gary Lewis Adventures, James (Elizabeth and Victoria’s dad), Jim Harris our photographer, Mikayla, and our hunters Alexa and Victoria were ready to go all dressed in clothing that was reminiscent of what our grandparents would have worn complete blaze orange. When the darkness faded to light, we made our decent down the small draw. As we all sat and glassed for deer, the poison oak bushes came to life before our eyes. Alexa had a beautiful buck on alert broadside for well over 15 minutes. Unfortunately, she did not have a buck tag. The does he was trailing remained safely tucked into the heavy oak, safe from rifle range. Shortly after, I spotted a lone doe bedded down; we devised a plan and made our stalk. Everything went perfect. Alexa got into position and was ready to take the shot, but when the doe stood, she proudly displayed her backside revealing herself as a Whitetail doe. Watching the doe disappear into heavy cover, we had all shared the excitement that Alexa certainly must have been feeling. Hiking out of the draw, the girls, me included, were thrilled with the two close calls that we had so early in the hunt. Down into another draw, thick with poison oak, we spotted several small groups of blacktail doe feeding together. Alexa and Victoria were able to spot, stalk, and fill their tags within minutes of each other. Alexa and her first blacktail doe. Alexa and I packing her doe down the draw. Later that afternoon, it was time for Lexi to hunt her first blacktail doe. Filled with anticipation, the ten year old climbed into my truck along with Victoria. Lexi talked about her fears and I sat and listened to her and thirteen year old Victoria discuss the upcoming hunt. It was one of the most memorable moments of my life hearing Victoria, who is now an experienced hunter having successfully harvested her first deer earlier that morning, talk to Lexi about what to expect, how she is going to feel and most importantly letting her know that she is going to do great. As Lexi headed into the green valley, Victoria and I stood on the sidelines silently cheering her on. Gary took Lexi into the field where she practiced her trigger squeeze until she could break the trigger on an empty round five times without disturbing the penny that he had laid on the barrel. Minutes into her hunt Lexi filled her tag on an antlerless blacktail. When Lexi returned, she was greeted by her mom, new friend Victoria and me. We were all there for her to share her hunt success story with. Everything had gone perfectly, spot, stalk and now she is now an experienced hunter, just like her friend Victoria. The next morning it was time for fourteen year old Elizabeth to hunt for her first blacktail buck. We spent the morning glassing the heavy poison oak for bucks when we spotted a small spike and a nice forked horn buck. Elizabeth, taking aim, she put the buck down in poison oak that was well above our heads. This was going to be an interesting recovery. Luckily for everyone who participated in the recovery, no one got poison oak and Elizabeth got her buck. Elizabeth and I with here first blacktail buck. The memories made on this trip will last for generations. 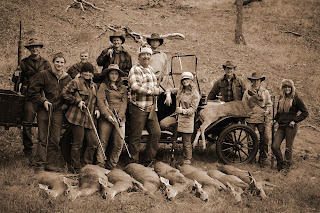 It gives me a great sense of fulfillment that someday Elizabeth, Victoria, Alexa, and Lexi will tell their own children about this very weekend and how they harvested their first blacktail deer. The hunting legacy will continue on through these girls.